Run Amok vs. Run Amuck: What’s the Difference? Home » Run Amok vs. Run Amuck: What’s the Difference? English has never been the most orderly of languages. It borrows words from a wide range of sources, and integrating them into a cohesive language is no small task. Even the words we use to describe chaos are, themselves, chaotic. The phrase run amok is also sometimes spelled run amuck, which at one time was the predominant spelling. Continue reading to find out whether you should choose amok or amuck in the phrase meaning behave uncontrollably and disruptively. What is the Difference Between Amok and Amuck? 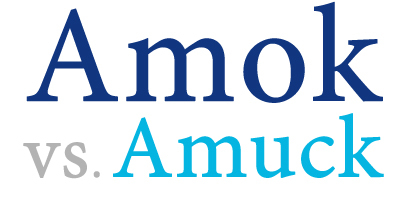 In this article, I will compare amok vs. amuck in their use in the phrase to run amok. I will use each in an example sentence. Then, I will explain a useful trick to help you choose either run amok or run amuck. What does amok mean? Amok is an adverb that describes something that is chaotic or out of control. Its nearly exclusive usage is in variants of the phrase run amok, which can be an adverb phrase or a verb phrase. Something that has run amok has devolved into wildness. The workers have run amok; they have plunged the factory into anarchy. The American political process is running amok. Footage of the substitute teacher losing control of the second graders showed a classroom run amok. What does amuck mean? Run amuck was at one point the more common spelling, but it has since fallen out as the predominant spelling. Garner’s Modern English Usage (GMEU) estimates that amok is used three times for every use of amuck, which is corroborated by the graph below. As you can see from the following graph, amuck was preferred up until the 1940s, but since that time, amok has overtaken it as the standard form. It’s also important to note that neither spelling is wrong or incorrect. One is simply used at a much higher rate. If you don’t want to distract your readers, however, you should choose amok. Since this graph only draws data from books written in English since 1800, to the exclusion of other print sources, it cannot be considered scientific. It is, however, still useful for identifying clear long-term trends in usage. GMEU mentions that both run amok and run amuck originated in the 17th century from a transliteration of a Malaysian word. Here is a helpful trick to remember run amuck vs. run amok. Though some writers still use amuck, amok is the standard variant of this word. You should use the latter in all contexts. Amok and chaotic both contain the letter O. Since these words are synonyms, remembering this shared letter will help you choose amok in your own writing. It is run amok or run amuck? Amok and amuck are two variants of the same adverb. It most commonly appears as part of the phrase run amok, which means out of control. While amuck and amok share a common origin, amuck has fallen out of favor. Today, amok is considered the standard spelling of this word. There is a simple way to remember which form is correct. The adverbs amok and chaotically are synonyms, and they both contain the letter O. Next time you can’t remember which of these phrases is correct, all you need to do is think about the meaning of the word. Failing that, you can always check this website for a quick refresher. 1 What is the Difference Between Amok and Amuck? Prognosis vs. Diagnosis: What’s the Difference? Cannot or Can Not: What’s the Difference?